Deacon John Supino is a native New Yorker, who moved to Fresno in 1953. After graduating from San Joaquin Memorial High School in 1958, he attended Fresno State College and obtained a Bachelor’s degree in History and a Master’s degree in Counseling and Guidance. 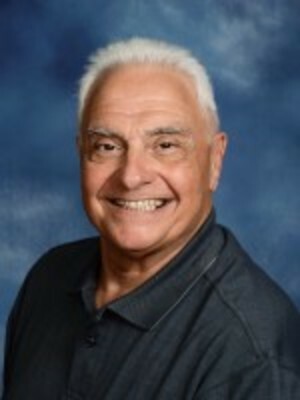 He taught and coached at St. Anthony of Padua elementary school for one year and at San Joaquin Memorial for 10 years and since 1977 has served as an insurance and investment professional. In 1996 he began studies toward ordination as a permanent deacon. He was ordained a deacon by Bishop John Steinbock on January 11, 2003. He was appointed as Parish Life Coordinator/Administrator for the Newman Center by Bishop Steinbock in November 2008. Deacon John has been a member of St. Paul Catholic Newman Center since its inception in 1964. In 1963-64 he served as the first president of the Newman Club student organization (now the Catholic Student Association). He met his wife, Luci, at the Newman Center. They have been married since August of 1965 and have three children and five grandchildren. Deacon Bill Lucido was born in Quantico, VA, and grew up in San Diego. He attended Sacred Heart Academy in Ocean Beach and graduated from University of San Diego High School. After two years at the University of San Diego, he transferred to Fresno State College and obtained a Bachelor’s degree in Mathematics in 1970. He earned his pilot’s wing from the United State Air Force and spent 30 years in the California Air National Guard. After retiring from the Guard, he served for 11 years as Director of Development, Director of Communication, and editor of the Central California Catholic Life for the Diocese of Fresno. In 2003 he began studies toward ordination as a permanent deacon. He was ordained a deacon by Cardinal Roger Mahony on January 15, 2011. As a Deacon he was assigned to serve at Saint Paul Catholic Newman Center by Msgr. Myron Cotta, the Diocesan Administrator. Deacon Bill has been a member of St. Paul Catholic Newman Center since 1970. He met his wife, Betsy, at the University of San Diego and they were married June 6, 1964. They have four daughters and nine grandchildren. I am Sister Kathleen Drilling, SSND. I was born and raised in Tulare and attended St. Aloysius parish and St. Aloysius grade school and was taught by the School Sisters of Notre Dame. I continued my formal education at Tulare Union High School, Fresno State University, Notre Dame College, in St. Louis, Mo. In the 80’s I returned to school for my Masters in Pastoral Studies from Loyola University in Chicago with a focus in Religious Education and in the 90’s attended Fresno Pacific to study Peace Making and Restorative Justice. Being born during the first wave of “baby boomers” has helped to make my personal history very interesting. A cradle Pre- Vatican II Catholic who has been formed in the exciting times of the 50’s and 60’s with all that came with it I can say, life has been interesting. Besides my family and friends St. Paul Catholic Newman Center Parish has been a constant and today feels like my spiritual home. I am a teacher and I look forward to continuing my life in Ministry here with you through the educational projects as part of the Newman Center Staff. We find ourselves in very exciting times, in the Church and the World, and it is my belief that this where we, together, find God and live the reality of The Kingdom here on Earth. John Prandini has been a parishioner at St. Paul Catholic Newman Center for over 37 years. He was married in 1976 to Jeanne Frye and they have three children: Kellen, Megan, and Heather. John graduated with 2 Bachelor degrees and a Masters degree from CSUF and recently received a Masters Degree in Pastoral Ministry from Holy Names University of Oakland CA in 2010. As an educator, he has been a full time instructor at CSU-Fresno, San Joaquin Valley College, and a part-time Thesis Coordinator at Fresno Pacific University. He has also taught fifth through eighth grade students at Sacred Heart School and has coached Varsity Track and Field, Football and Freshman Basketball at San Joaquin Memorial High School. John is a member of the SJM Athletic Hall of Fame. John has completed many courses in Religious Studies and the Social Sciences at CSUF, and has also completed over five years of religious education and training through the Diocese of Fresno. He has taught Scripture and Lay Ministry courses in the diocese’s New Wine program, has certifications in Bereavement and Pastoral Ministry, is a member of the Diocese's Marriage Ministry Task Force and has presented in the Diocesan Religious Education Congress. He is a member of the Interfaith Alliance and has helped with the annual Interfaith Scholar Weekend. I am an active member in High School Ministry and Faith, Family & Friends. My association with St. Paul Catholic Newman Center began in 2012 as an intern for Faith, Family & Friends. I joined the Newman Center staff in 2013 as a High School Youth Minister. I was born and raised in Madera, CA and attended Sierra View Elementary School and Liberty High School. I am a recent graduate of California State University, Fresno with a Bachelor’s degree in Sociology in 2013. I want to provide the youth in today’s society a sense of belonging and pride in their religion. I joined our Newman Center Family in 2011 as a parishioner. I began to volunteer in the office in 2012, and officially joined the Newman Center Staff that summer. I was raised in Fresno, and I attended Sacred Heart School and San Joaquin Memorial High School. I graduated from the University of California, Davis with a Bachelor’s degree in Psychology and Sociology in 2010. Since serving one's parish is an important reason as to why I started working here, and a calling for every lay person in the Catholic church, I am involved with many of the ministries here at the Newman Center. I am an active member of the Newman Center Young Adults, Stephen Ministry, and serve as a Eucharistic Minister. I also work closely with the International Food Festival and Mardi Gras committees. Please feel free to contact me if you ever want to become involved in any of our ministries: new faces are always welcome! I look forward to meeting more members of our wonderful Parish!